It’s true, I pin lots of cute “ideas for later” on my Pinterest page that I never quite find the time to do. Usually it comes down to lack of money or lack of time or lack of equipment (or all three). So when I saw some sweet easy-peasy jar candles and realized that I already had all of the items needed to make these in my closet, I jumped at the chance to get creative! 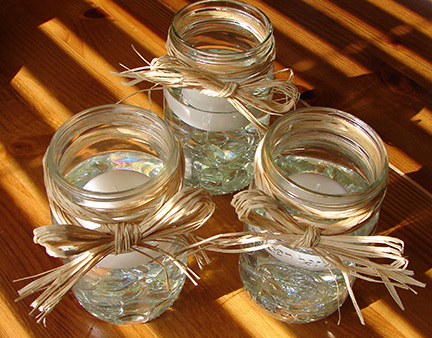 All it took to make these Mason Jar Floating Candles were three glass jars from my stash ( two of them are actually old mayonnaise jars! ), a bit of raffia that I had leftover from Christmases past and a few unscented floating candles from Pier 1 that I’d bought on sale and been saving from since I don’t know when. Wrap, tie, snip, fill, splash, done! These look oh-so-pretty lighted and sitting out on my porch at night.